An effective multi-objective optimization methodology that combines the isogeometric analysis (IGA) and adaptive chaotic particle swarm algorithm is presented for optimizing ceramic volume fraction (CVF) distribution of functionally graded plates (FGPs) under eigenfrequencies. The CVF distribution is represented by the B-spline basis function. Mechanical behaviors of FGPs are obtained with NURBS-based IGA and the recently developed simple first-order shear theory. The design variables are the CVFs at control points in the thickness direction, and the optimization objective is to minimize the mass of structure and maximize the first natural frequency. 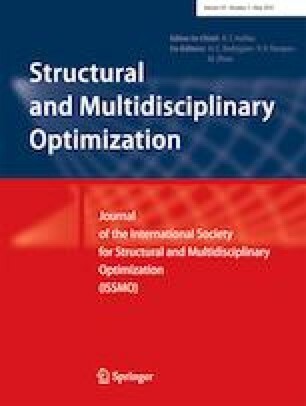 A recently developed multi-objective adaptive chaotic particle swarm algorithm with high efficiency is employed as an optimizer. All desirable features of the developed approach will be illustrated through four numerical examples, confirming its effectiveness and reliability. The authors would like to thank all the anonymous referees for their valuable comments and suggestions to further improve the quality of this work. This work was supported by the National Natural Science Foundation of China (Grant No. 61375068) and the Fundamental Research Funds for the Central Universities (Grant No. 2018B48614).